If you read the back of the wrapper your loaf came in you might be a little shocked, especially if it’s Supermarket bought, white pan loaf…seriously have a look, it’s fookin’ scary the stuff that goes in there. Now, I knew there was a lot of crap in ‘processed’ bread but when I watched the Great British Food Revival last night with Michel Roux I was super stunned at exactly how much crud goes in there! Bread is made up of 4 main ingredients – flour, water, yeast and salt – that’s bread. The addition of stabilisers, e-numbers and radio active mouse fur means it’s not bread any more but something that Bruce Campbell should be fending off in an Evil Dead flick. 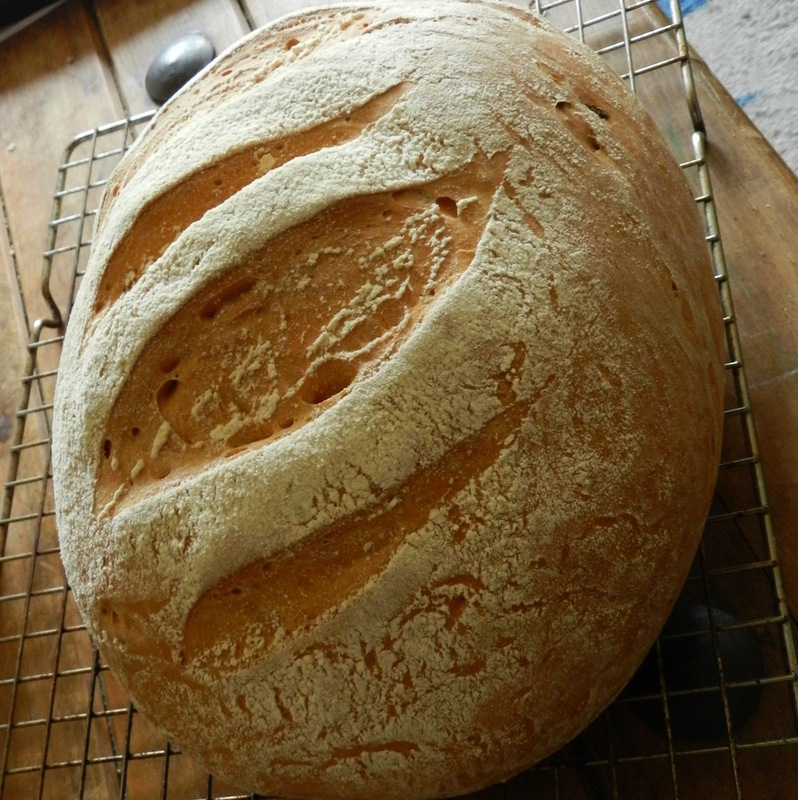 The loaf in the pic I made last Saturday night for my Sister in Law and her kids – who incidentally loved it which ensures I can hang up my boots a happy guy…if my Nephew Dan likes my stuff, then it’s quality!! It’s a simple white loaf with the addition of chopped Sun dried tomatoes and a scattering of cumin seeds through the mix. The taste is very subtle but it looks great when you cut it open and it’s a healthy tomato red colour…..bit of a conversation piece if you having snooty pals round who dine exclusively on white pan!! Same as every quality bread recipe – in a big bowl combine the flour, yeast, cumin, tomatoes and salt (in that order) – mix well then lash in the water. Bring everything together with a fork then in with yer mits. Once the dough has ‘formed’ a bit sling it out onto a floured work top and literally go to work on it – rip, stretch, beat, insult, condemn and fold…all in that order….for at least 10 minutes. Form into a smooth ball, bung back in the bowl, cling and sling in a warm, dry, dark place – leave to at least treble in size – longer the better. Turn out again onto the same surface and give it another right hiding for a couple of minutes making sure you knock the air right out of it – form into whatever shape you fancy then set on a baking tray and let prove for 30minutes. When it wobbles like a jelly then get it right into a full tilt oven for 30minutes. Aswell as the tap test you can stick a skewer into the bread and it is come out clean with no resistance then it done – now make sandwiches and impress your neighbours with your red bread!